You may represent yourself in a West Virginia divorce. This article discusses the petition for divorce made available on the West Virginia Judiciary website. This form can be filed whether or not there are minor children involved in the marriage. West Virginia Petition For Divorce SCA-FC-101 Step 1: At the top of the page, enter the names, addresses, phone numbers and Social Security numbers of both parties. West Virginia Petition For Divorce SCA-FC-101 Step 2: Enter your name in the first paragraph where indicated. West Virginia Petition For Divorce SCA-FC-101 Step 3: In section one, indicate with a checkmark the West Virginia residency status of you and your spouse. In section two, do the same regarding the county in which you are filing for divorce. In section three, write the county where you currently. Do the same for your spouse in section four. West Virginia Petition For Divorce SCA-FC-101 Step 4: In section five, give the county, state and date of your marriage. In section six, give the last address where you and your spouse lived together. West Virginia Petition For Divorce SCA-FC-101 Step 5: Answer all questions in section six regarding whether either spouse is in the military, under 18 years old, or mentally or physically incapacitated. West Virginia Petition For Divorce SCA-FC-101 Step 6: Sections eight through fifteen concern children and should only be answered if any are involved in the divorce. West Virginia Petition For Divorce SCA-FC-101 Step 7: In section sixteen, check the box if you are requesting the alimony. Do the same in section seventeen if property or debts must be divided by the court. West Virginia Petition For Divorce SCA-FC-101 Step 8: In section eighteen, check the box and write in your former name if you wish for it to be restored. West Virginia Petition For Divorce SCA-FC-101 Step 9: Check all statements from sections nineteen through twenty-one which apply to your marriage. Write additional grounds for divorce in section twenty-two. West Virginia Petition For Divorce SCA-FC-101 Step 10: Check the box next to all statements concerning rulings and actions you wish for the court to take. 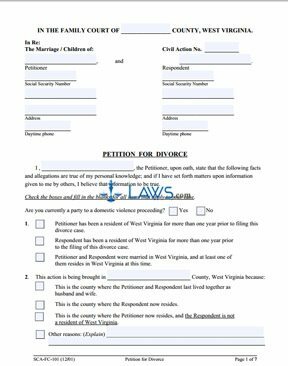 West Virginia Petition For Divorce SCA-FC-101 Step 11: Sign and date the form before a notary public or another licensed official.